John Cage is rightly given the credit for inventing the prepared piano, the practice of placing tone-altering objects between or on top of the strings of a grand piano. His music in this realm revolutionized the sonic possibilities, creating a kind of percussion orchestra that both recalled and transcended non-Western structures and gave avant garde new music a new direction that in part stays with us today. His Sonatas and Interludes for Prepared Piano (1946-4) gave us his most elaborate and satisfying work in this realm, and it still enjoys world-wide renown. Others have taken up writing and working with prepared piano configurations. 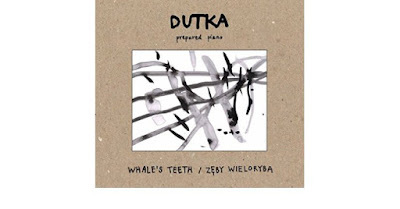 Enter Warsaw born and based composer, pianist and painter Dutka and his six part series of impromptus for prepared piano collectively entitled Whale's Teeth (DUX 1379). The piano is prepared from natural objects, mostly in the lower half of the instrument. Like Cage's pioneering work, most of the music has a pronounced rhythmic drive, taken often in the form or ostinatos and variations on them in the lower register with the right hand providing counter-rhythmic figures and melodic runs that have at times an avant jazz flavor, other times a ritual primality. All comes at us loosely, with an improvisational spontaneity yet a coherent roadmap guiding the direction of each. It is music that extends the implication of Cage's legacy without being overly derivative. It is a program both provocative and enjoyable--not necessarily some huge breakthrough but filled with rhythmic presence and a sound color palate alternatingly and simultaneously both bright and dark. A lively and stimulating listen! Georgy Sviridov (1915-1998)? The back cover blurb to the release at hand tells me he is one of Russia's most celebrated modern figures for his vocal works. So no doubt he is someone whose music we should hear. For some reason I have not. To make up for the lack, there is the recent recording featuring Russia Adrift, Snow is Falling and Music for Chamber Orchestra (Naxos 8.573685). Featured are mezzo-soprano Mila Shkirtil, pianist Nikolay Mazhara, the Rimsky-Korsakov Music College Female Choir, the Boys of the St Petersburg Radio and Television Children's Choir, and the St. Petersburg State Symphony Orchestra, all under conductor Yuri Serov. Sviridov had Shostakovich as his compositional mentor. Yet happily the three works on the present compilation show a musical mind with its own sense of melodic tonal-modern momentum. There is a lyric gift there to hear, without doubt. And an essentially Russian dramatic quality to this music can be readily heard throughout. "Snow is Falling" (1965) begins the program on a charmingly disarming note. Sing-songy folkish playfulness (such as sometimes you can hear in Orff) wins the day with a tenderly expressive part for women's chorus and a dreamy orchestral carpet like a blanket of new fallen snow. "Music for Chamber Orchestra" (1964) has a decisive interlocking dialog between piano and orchestra. There is a motility that suggests a lineage going back to Shostakovich, Prokofiev and Stravinsky without the derivative musical syntax that might entail. 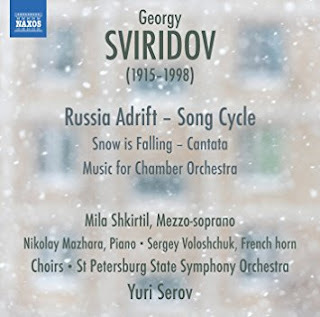 "Russia Adrift" (1977/2016) enjoys its recorded debut in the mezzo-soprano and orchestra version masterfully realized by Leonid Rezetdinov. It is epic and wondrously deep, with a long and ruminating opening and a heartfelt songfulness mezzo-soprano Mila Shkirtil gives to us with a perfectly artful and moving sonance. She is a wonder. Kathleen Ferrier comes to mind, yet only in association, not that the two sound alike. The orchestral part is equally apt and resonant. And so that is what is in the offing with this release. I must say I am very pleasantly surprised and in the end very comfortable wearing this music on my ears. It is like Fridays can be. A return to the power of the space and time of something that reaches out and transforms while giving great pleasure. This is music that with wear becomes like a favorite pair of flannel pajamas. Ever better. Hear it! Let Beauty Awake (BIS 2183 SACD). 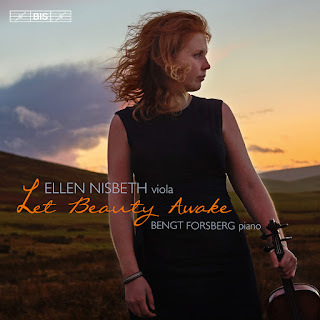 As the title suggests, violist Ellen Nisbeth and pianist Bengt Forsberg treat us to some five modern 20th century English works of pronounced beauty. That is most inherent in the scores by Vaughan Williams, Rebecca Clarke, and Britten. It is most apparent in the exquisite performances by the talented Nisbeth and her nearly perfect foil Forsberg. This is not neo-romantic beauty so much as it is English, sometimes slightly rustic and slightly plaintive post-impressionist sturdiness. Ralph Vaughan Williams starts things off with "Five Songs from 'Songs or Travel" (transcribed for viola and piano) and his "Romance for Viola and Piano." Rebecca Clarke, a composer seemingly undergoing a pronounced resurgence, makes a splash with "Sonata for Viola and Piano," something a bit more formal and ambitious but equally evocative. Benjamin Britten has the last say with his "Third Suite for Cello" transcribed for viola and wonderfully well done by Ms. Nisbeth. The final "Lachrymae for Viola and Piano" tops all off with completely striking affective fare. Nisbeth has ravishing tonal breadth that runs from achingly sweet to dramatically dark. She is ever in control, phrasing like an angel or singing with rough passion. The five works on the recital disc seem especially made for the gamut of her lyric spectrum of expression. And there is a very Englishness to the works which reminds us why last century was such a fertile one for the region, filled with remarkable composing talents. With the final notes we feel as if we have been transported to a rare musical place where lyric strength and fragility is given near ideal, long shrift. Nesbeth and Forsberg seem born to this music. And the selection of works hang together with a complete fittingness. 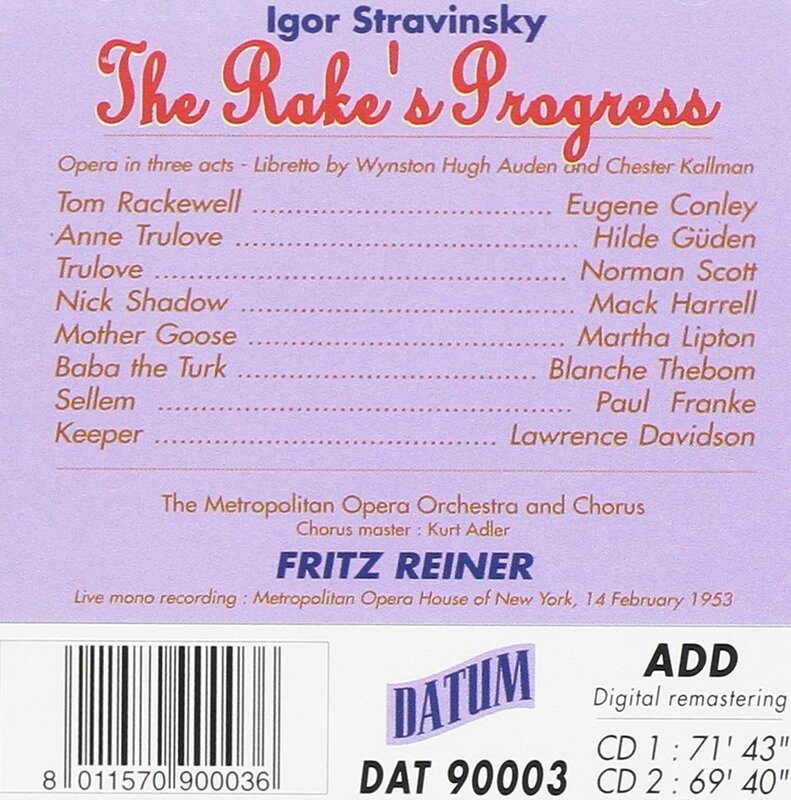 To be honest, Stravinsky's final opera The Rake's Progress has been a work where I tend to run hot and cold. Ever since I found an original LP set pressing of the mono version with Stravinsky himself conducting (which was around 1982 in Chicago), I've found parts of it to be extraordinarily moving, other parts to be wearing a bit thin after countless listens. Admittedly it is one of the opera masterpieces of the first half of the 20th century, but perhaps a flawed one. There are sections needed to move along the plot and then there are sublime moments, many of them, that epitomize and conclude the master's neo-classical phase. In the end the sublime majority of the music wins the day. 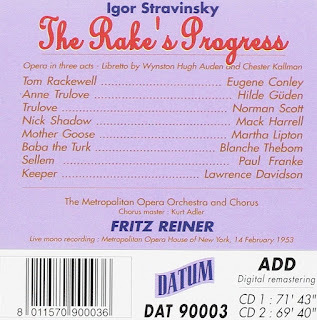 I've encountered the opportunity to review another version, a recording like the old mono LPs from 1953, again with the Metropolitan Opera cast, this time with conductor Fritz Reiner (Datum DAT90003 2-CD). It is a live recording but a well handled performance with no egregious gaffs. It would appear from the date it was recorded that (thanks to Wikipedia) this must have been the World Premiere perfomance of the fully staged opera? The opera has a sell your soul to the devil theme like "A Soldier's Tale." But as Hogarth's celebrated engravings on the Rake and his downfall are the basis of the plot, it is general worldly success and good luck with women that are the Devil's end of the bargain. In the end though Nick the Shadow wreaks havoc. This version has much going for it. The live versus the "studio" version and Stravinsky's direct conducting of the latter version means that orchestral parts perhaps have slightly more "bite" and polish on the old Columbia disks. But the overall trajectory of the whole is well served in either version. The cast is virtually the same. Eugene Conley as Tom Rakewell and Mack Harrell as Nick the Shadow especially distinguish themselves on both recordings. I see on the web that the original Columbia LPs have been available on Naxos as a CD set, and perhaps still are. If so that version may have the slight edge. Nevertheless the Reiner version is very good. The live version may have the edge for the vocals in terms of performativity. The Naxos excels on the orchestral end. 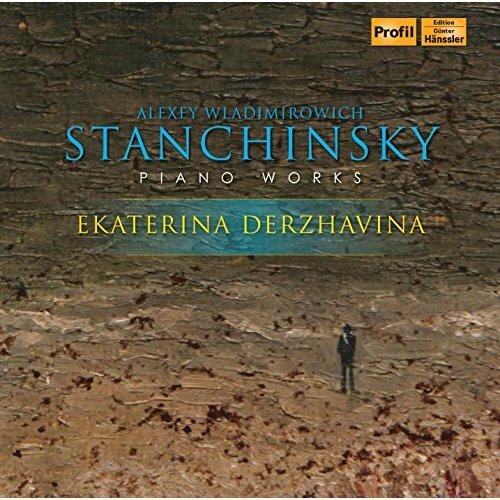 For Stravinsky die-hards both versions and some later ones as well may appeal to you. I am glad to have the two. What sounds right in a modern zone can come through invariably if you have a composer and ensemble that knows what they are about. Ensemble Interface and composer Patrizio Esposito create such a rightness on the album at hand, Resonating Body (Stradivarius 37066). We experience a minutely detailed experience of what one might call "boom-klang polyphony" on this worthy compendium of four Esposito chamber ensemble works. Instruments in single or clustered outbursts make a tightly woven whole out of intricate instrumental entrances and exits, and the timbral contrasts that affords. Nothing is lacking in the four works represented. And the instrumentation varies slightly or radically to keep our ears refreshed. "D'amor la vecchia canzone" (2010) makes use of flute or clarinet plus violin, cello, piano and electronics for a sequencing that is bracing and conflates in good ways the sensibilities of new music and avant jazz without alluding to quotation. "Resonating Body" (2016) is scored for flute and bass clarinet, both doubling on slide whistle, along with violin, cello, piano and percussion. "While" (2016) features flute, clarinet and bass clarinet, cello, piano and percussion. Finally "nachinander" (2016) is for a single "Jack of all trades" percussionist. The ensemble under the direction of the composer grabs on to the essence of each work and delivers powerfully. Esposito shows great poise and balance in these modern gems. They all have something to do with Joyce's Ulysses. I will leave you to the liners and your ears to uncover that. The liners also posit a relationship to this music and the pathfinding Nuova Consonanza, which I agree is there and has to do with an avant jazz-new music nexus one relishes from start to finish. Suffice to say that this is one of those essential modernist forays in our current situation. It satisfies and stimulates. Excellent! All new music devotees will want this one in their collection. For present-day modernist contemporary orchestral music, one does not find a more talented and sure handed exponent than the English composer Thomas Ades. Put simply he is an inventive and orchestrational master of our times. Three major works and a short rejoiner comprise a most welcome contribution to the Ades discography by the London Symphony Orchestra. The four compositions cover a broad period between 1997 and 2010. 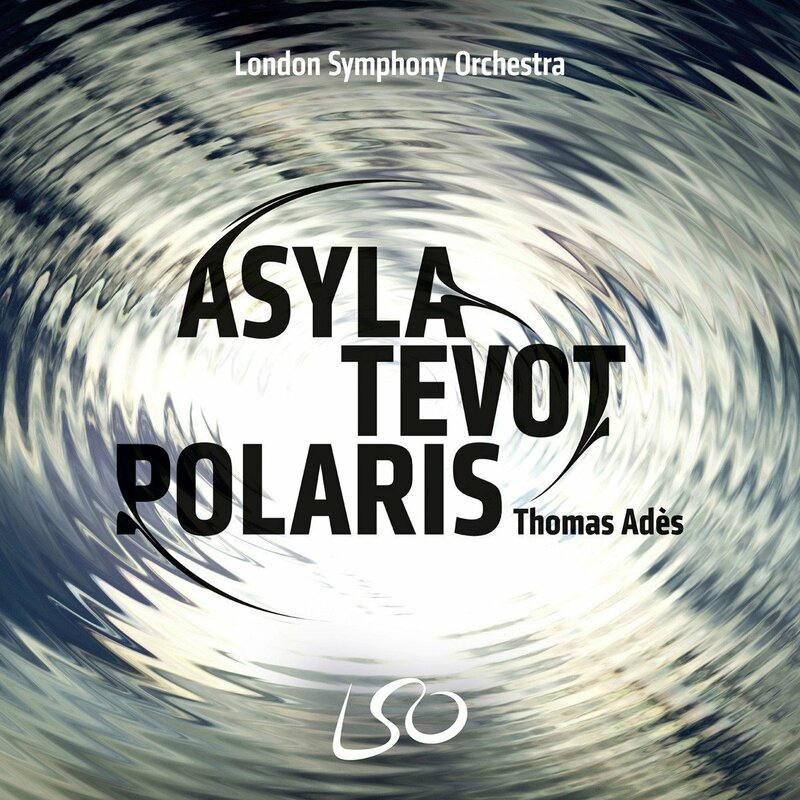 Asyla, Tevot, Polaris (LSO 0798) and the brief "Brahms" canvas an enchanting and stirring terrain that tightly knits original content with brilliant orchestral apportioning. One feels with all of this music that Ades is in his element, that there feels like there is a one-to-one relationship between musical ideas and how they are shaped by the orchestral mass. "Polaris (Voyage for Orchestra)" (2010) explores, in Ades' own words, "the use of star constellations for naval navigation and the emotional navigation of the absent sailors and what they leave behind." It is a deeply spacial and ghostly panorama that pits brass choirs off stage with myriads of rapidly moving but quietly articulating points of musical light. All twelve tones are utilized with three poles of magnetic pitch centers holding sway one by one. It is as if the vivid night sky reminds us of the sailors who have left us on a journey no longer dependent on currents and oceanic spans.They now are within those constellations, journeying forward outside of our standard accessible material world? Maybe. Brahms (2001) is a brief homage to what Ades refers to as the logic of Brahms' music, as aside from the warmth and beauty of it. Samuel Dale Johnson on baritone presents an expressive text atop an orchestral atmospheric. Backtracking to the opening "Asyla" (1997), it centers around places of safety, of confinement, of last resort, away from a mad world. They are epitomized by the concert hall and the presence of orchestra, a place where "we feel at home, or where we once felt at home." There is something remaining of the madness of life present in the score, a holding in place and aestheticization of the danger outside, a cultural domestication. The music is pointed, colorful, and resituated within itself in ways that evoke the refuge and the thing from which we flee, if I can take the liberty of my own reading of it all. "Tevot" (2005-6) is effectively Ades' second symphony, based on the Hebrew "tevot" which means both the bars in a musical score and words. In the Bible it refers to Noah's Ark and the reed basket fashioned by Moses' mother to take him down the Nile, in both cases places of refuge, structures made of "firm materials." Ades conceived of these complexes of meanings in a totality, where the bars of music act as vessels for the music and its journey through fluid danger. The music creates organic periodic repeating and variational snippets bordered by bar lines. It is ingeniously structured and fashioned, containers and their contained. Brilliant in its immediacy and parcelling out. It is that. So we have the sum of what we most willingly hear on this new collection of Ades' works. Each is striking, seemingly inevitable yet paradoxically surprising in its individual outcome. Ades is like that. You get what you have every reason to expect, but in that getting you are moved into the realm of the unexpected. The CD comes in two versions on two discs, the standard two-channel CD audio version and the multiple voiced BluRay. Either way this is extraordinary music, landmark-scapes of richly varied orchestral sense. Get it by all means! 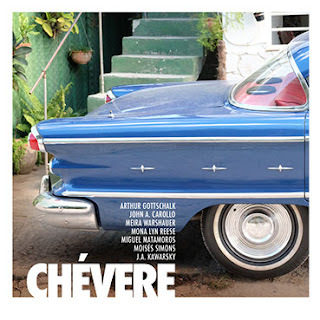 Ansonica Records continues to create situations of Cuban-American confluence, collaborative projects that bring together US composers and Cuban composers and instrumentalists. Chevere (Ansonica 0005) documents a January 2017 session where a sense of adventure holds sway and leads to consistently interesting results. The tone is set decidedly with Arthur Gottschalk's "Imagenes de Cuba," a chamber work based upon the familiar "Peanut Vendor" theme. From there we have the always absorbing John A. Carollo and his "In Your Hour of Need," a wonderful piece that combines Cuban rhythmic roots with a freewheeling new music attitude. The results are uncanny yet decidedly right. We go from there to another five works, all interesting and at times surprisingly unexpected, such as Meira Warshauer's two Jewish-tinged amalgamates, "Akhat Sha'alti" and "Oseh Shalom." Further on we have notable contributions by J.A. Kawarsky, Miguel Matamoros & Moises Simons, and Mona Lyn Reese. It all makes creative use of the frisson that can result when cultural intersections connect with creative symmetry and contrast. A very rich and rewarding experience can surely be had with the program. Viva! The figure of composer Leo Ornstein (1893-2002) remains obscurely but constantly visible on the Euro-American scene if one looks carefully for his music. A Russian Jew born in present-day Ukraine, he came to the United States (New York) in 1906, where by around 1920 he was the enfant terrible of modernism, as a composer and pianist. Then he abruptly abandoned his concert career and went on to teach. His music faded from the limelight and he lived out his long life in relative obscurity. His music nevertheless still speaks to us. Some of it is tonal and late romantic, some of it daring and boldly dissonant. In the recent Complete Violin Sonatas (Brilliant Classics 95079) we get both Ornstein styles, the modern iconoclast and the romantic lyricist. The soaring violin component is a constant, the piano element determining largely which of the two creative poles are dominant in any moment, and sometimes, as in the "Hebraic Fantasy," there is an uncanny commingling of both elements and Jewish tonality with a decidedly expressive flourish. We hear his two published Sonatas, the Hebraic Fantasy and an Op. Posth. Third. It gives us a long listen to how he looked at the violin-piano totality. And then as a bonus we also get "Three Pieces for Flute and Piano," which takes flight in a middle ground halfway between the avant and the romantic. And in all of it the modernist and the expressionist are at the forefront, neither the one nor the other having absolute reign. And there is the Jewish-folk element present, too. The performances are uniformly excellent. 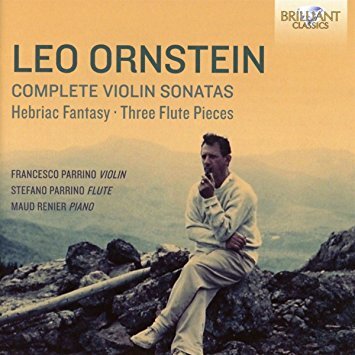 It is a valuable addition to the Ornstein discography. It may not be a demonstration disc for his radical modernist side, but then again it gives us a balanced look at his overall thrust and appeals uniformly as good music. Recommended. It is a truth albeit an obvious one: you never know until you know. We know that by living our lives. And listening. Someone a while ago might have advised me to listen to the Piano Works (Profil Edition Gunter Hanssler 170003). Hearing is believing, in the end. And the results reveal a composer of original, somewhat eccentric and unexpected stature. Alexey Wladimerowich Stanchinsky (1888-1914) died at just age 26 at the start of a religious pilgrimage that took him just a short distance from his home. He had to wade neck-deep across a river and the exposure cut short his existence. He was a student of Taneyev and studied piano at the Moscow Conservatory. A severe bout with mental illness undermined his health. The pilgrimage put the final punctuation on his life. 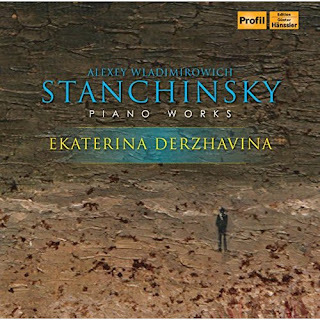 But he left behind a bold and daring series of piano works, some remarkable examples of which can be heard as played with zeal and precision by Ekaterina Derzhavina on this fine volume. The first bars of his first opus "Zwolf Skizzen" let us know we are in for something unusual. Sorabji or Alkan come to mind, not so much as an imitation as a parallel. Then there is Mussorgsky, surely. The rest of the pieces in this startling opening salvo bear out the first impression. This is a remarkable late romantic kind of modernism that must have startled its hearers even more than it does our modern listening selves. More than 100 years later, however, we nevertheless sense we are in the presence of a unique musical voice. The "Praeludium," "Erste Sonate," and "Lieder ohne Worte" confirm our first encounter. Often enough there is a thoroughly "conventional" Lisztian overwrap of rhapsodic effusiveness to be heard. But even then the actual sequences can startle for the unexpected progressions or melodic directions the music takes. And that veneer can strip away and you get another look at a musical mind that strikes boldly out on then untrodden paths. As the liner notes state about the sonata, there is a "distinct predilection for the juxtaposition of diatonic modes [instead of the customary development of chromatic harmonies]." Yes, and how they sequence is not expected either. Chords in fourths, even, but not like Scriabin. There are all kinds of things in this music that set it apart. Yet it reflects the veneer of the grand romantic piano tradition, too, when that seems appropriate. Unexpectedly, always. The sessions come from 2004 and 2005, so my guess is this has been released before? It makes no difference. This is a revelation. Stanchinsky, had he lived, could have taken us into another universe of possibilities. Yet there is plenty to hear already in his short life's output. Ives went his very own way in the US. In Russia Stanchinsky was going somewhere bold, too. He was cut short. Thankfully we have this volume to savor. Stanchinsky may have been a well kept secret. We can now let this music out in the open. Let it breathe. Thank you, Ms. Derzhavina for giving us these beautiful performances. Thank you, Stanchinsky for your short life and its music! Why I am not sure. I have had some recorded version of Aaron Copland's Symphony No. 3 (Naxos 8.559844) for many years. Yet upon hearing this new version by Leonard Slatkin and the Detroit Symphony Orchestra, I am struck by why I have not been more mindful of its power and great beauty. I hear it as if for the first time. Perhaps it is in part because the fourth movement is performed in its original uncut form, it alone running some 15 minutes. It endpins the symphony in a palpably more dramatic way. And in its longer form is becomes something more than a quotation of his seminal "Fanfare for the Common Man." It instead becomes a central thematic element. Yet it is more than merely that. Like "Appalachian Spring," where the Shaker hymn "Simple Gifts" tops off the work and gives it a trajectory, yet contains all in all some of Copland's most evocative pastoral music, so too the Third is redolent with an earthy joy, at once pastoral and filled with both rural and, if you will, some of the bustling celebratory complexities of the American town. And too the "Fanfare" is a thematic culmination. So many years later, we can be less mindful of the central role the end of WWII is meant to play out in this symphony, written in 1946. Like Shostakovich and Prokofiev did in their symphonies of this period, it expresses a relief that the struggle is over. Copland's general sanguine outlook gives us something more in the line of pure joy than his Russian counterparts may have expressed. That is only to say that Copland remained Copland, as Shostakovich and Prokofiev remained true to themselves as well. And in all that we hear a near ideal reading of the symphony by Slatkin and the Detroit Orchestra. The placid beauty of America at peace, the bustle of renewed life and the tribute to the heroic efforts of "the common man"come together for a whole that I seem to hear cohesively as if for the first time. The longer version of the final movement helps give the work a new balance it may not have quite as readily in the version we usually hear. But Slatkin gives each element equal and detailed weight so that we come away moved and satisfied. 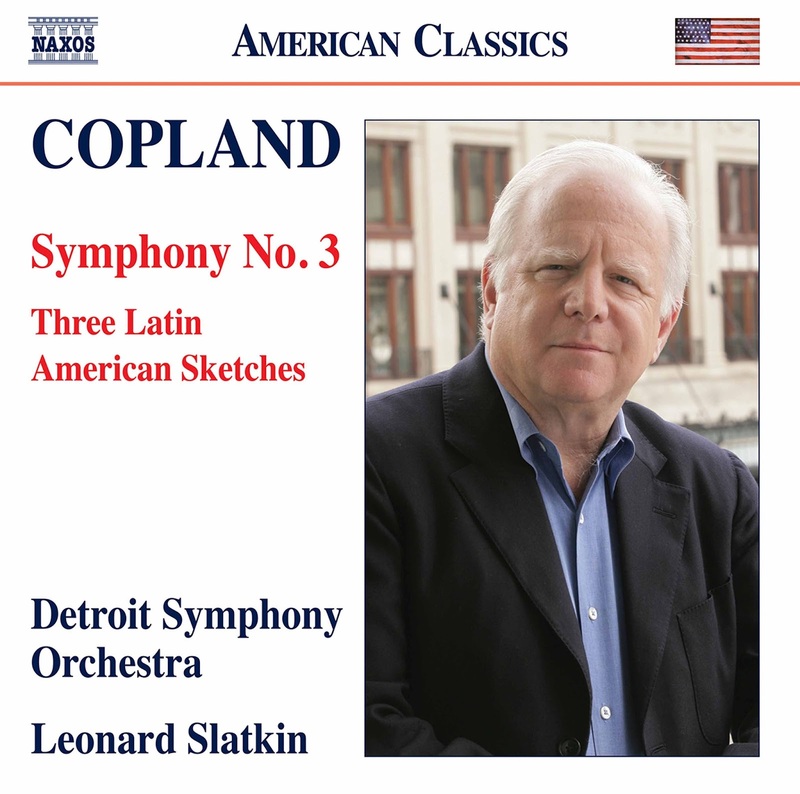 As a bonus we also get a nice performance of Copland's 1971 "Three Latin Sketches," which fits in as a rewarding coda to all the music here. So that is what we have on this one. It is a version of Copland's Third that makes very musical sense out of the score, balances out expression and nuance, draws out the very powerful totality Copland meant us to hear. It is landmark and worth the trouble, very much so. There are musical gatherings that are more than a collection of musicians addressing a body of works. There are those most welcome but also most rare of confluences, the time when magic prevails. 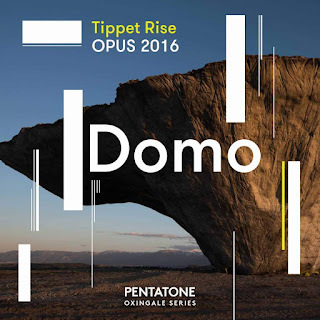 Such was very much the case with Tippet Rise OPUS 2016 and their Domo (Pentatone Oxingale Series 5186 660). The recording documents a concert held last year at the Tippet Rise Art Center in Montana, set on a stunningly beautiful natural and sculptural site that most apparently lends itself to inspired music making. Domo gives us a remarkable chamber music program of mostly early modern Russian chamber landmarks and a few notable other works, all performed with uniformly high caliber artistry. Everything begins with a roaringly dramatic performance of Scriabin's "Piano Sonata No. 5," a very singularly passionate reading by Yevgeny Subdin that to me stands out as one of the most moving I've heard. It is followed by two songs and a piano work by Anton Garcia Abril, performed with care by pianist Christopher O'Riley and soprano Emily Helenbrook. O'Riley then joins with cello master Matt Haimovitz for a ravishing version of Rachmaninoff's "Vocalise." Then we are treated to an infectiously joyful version of Stravinsky's third movement for the solo piano version of "Trois mouvements de Petrushka" played with nearly ecstatic verve by Jenny Chen. From there we get quite stimulating versions of the second movement from his "Suite No. 1" (O'Riley and Anne-Marie McDermott, pianos) and Chopin's "Nocturne Op.15, No. 2" (Stephen Hough). The fitting and most notable climax and finale comes with a trumpet and two piano version of Scriabin's "Poem de l'extase," with O'Riley and Svetlana Smolina on pianos and Elmer Churampi on trumpet. I've never heard the chamber version and I must say in the very capable hands of these three artists the music has all the mystery and thrust of the orchestral version but at the same time an intimacy that is different and refreshing. So I am not one to gush about what could on the surface seem to be an ordinary concert of mostly well-trodden repertoire pieces. It isn't. The performances are marvelous, uniformly so. Anyone who cherishes the Russian early modernists will surely find this a very memorable recording. 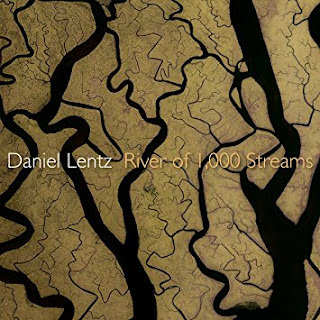 River of 1,000 Streams (Cold Blue Music CB0050) has a logical horizontal flow that has to do with an experiential "aha" moment Daniel Lentz had while standing on the banks of the Colorado River one early morning. 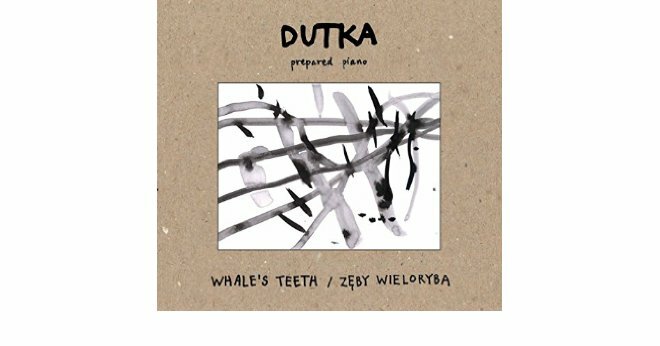 What he felt inspired him to conceive of this EP length work for solo piano and "cascading echoes," the latter of which appear very subtly and organically in the course of the work. Vicki Ray brings life to the part with sureness and sensitivity. Just as you cannot step in the same river twice, you cannot hear this work each time without feeling a new aspect of what you hear. And as a reviewer, if your original article was somehow wiped out as mine was sometime this past Tuesday, you cannot write the same review twice! Technological life is filled with such temporal anomalies. We no longer need Star Trek to experience virtual worm holes in the space-time continuum. Involuntary erasure gives us all we would ever want, which in fact is very little in this case! There is the constant of the dramatic arc of the music, beginning quietly and gradually building in developmental sequences of sostenuto shimmers of radically tonal rolls of chordal clusters that flow along river-like, adding embellishments and thematic directional cues that turn it all after all into musical syntax and not just atmospherics, though even if Lentz kept it entirely primal we would be transfixed. But no, he wants us to embrace its long sprawling arc of cosmic event unfolding as a very long whole. This is an excellent example of the Cold Blue school of mesmeric tonality. It speaks with a sprawling yet disciplined eloquence and takes us on a trip as would a river's endless flow. Beauty is there for us. We only have to stand (or sit) and hear the music go by. There are living US composers that you find you have missed completely, yet you can think of no good reason why. Wayne Peterson is one of those, even though he won a Pulitzer Prize in 1992 for "The Face of the Night, The Heart of the Dark." My excuse perhaps is by 1992 I began a work situation that gradually ate up all my available time through 9-11 and its absolute, permanent collapse. I picked up the shreds of my life though and I slowly caught up with the very important developments in that period. Looks like I am still catching up! 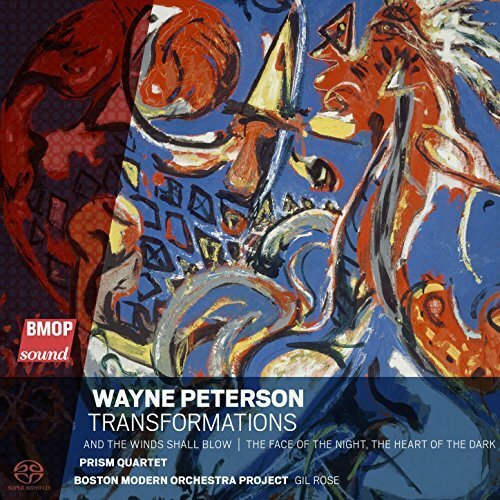 Nonetheless I am very glad to make the composer's aural acquaintance on his new collection of orchestral compositions, Transformations (BMOP Sound 1053), with the ever-essential Boston Modern Orchestra Project doing the honors under conductor Gil Rose, and the PRISM Quartet stepping in for the spotlight role on the work "And the Winds Shall Blow." He writes complex chromatic music, high modernist shrines of intricate latticework. If you imagine Elliot Carter, and why should you not, you might put Wayne Paterson in his league, so to speak, not as some clone, but another highly individual later modern chromaticist. That to me is an extraordinarily good thing! 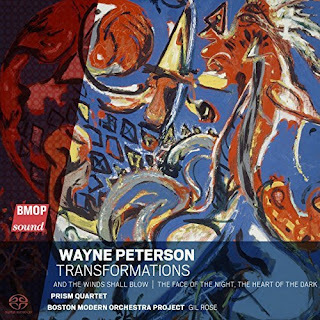 In the three works on this recording, we hear Peterson at his best. The Pulitzer Prize work "The Face of the Night, The Heart of the Dark" (1990) gets focused attention and we are all the better for it. It like the other works here give us a swirl of continually evolving phantasmagorias of sound, classic but evolved sound color matrixes of brilliant explosions and implosions of vivid hues and rhythmically charged musical utterances. And with the opening works, "Transformations" (1985), "And the Winds Shall Blow" (1994), we get variational fireworks of constant refluxive reiterations and post-iterations, if you will have it. "Winds" distinguishes itself via the welcome presence of the PRISM Saxophone Quartet, who with wind and percussion create an aura of deft interwoven complexities. This is fabulously complicated high modernist profundity. Anyone (like me) who still thrives on the ear stretching kind of contemporaneity will take to this as exceptionally invigorating. The running joke has been that Wagner's music is better than it sounds. The same could be said of Arnold Schoenberg. He is recognized of course as a major pioneer in modern music, devising the 12-tone system of compositional organization and etc. But his music is not nearly as much performed or as universally loved as many other composers of his century. I would counter that his music sounds much better than what we might expect from a structural wizard. The music never sounds arid or academic, but ever inspired and genuinely human, genuinely masterful and expressive. Unlike his pupil Webern, Schoenberg intentionally straddled the future and the present-past. His music no matter what else came out of and advanced the music of his time. Webern was no doubt the more radical in his rethinking of thematic means and avoiding direct rootedness. To note this is not to denigrate either. It is only to situate both. 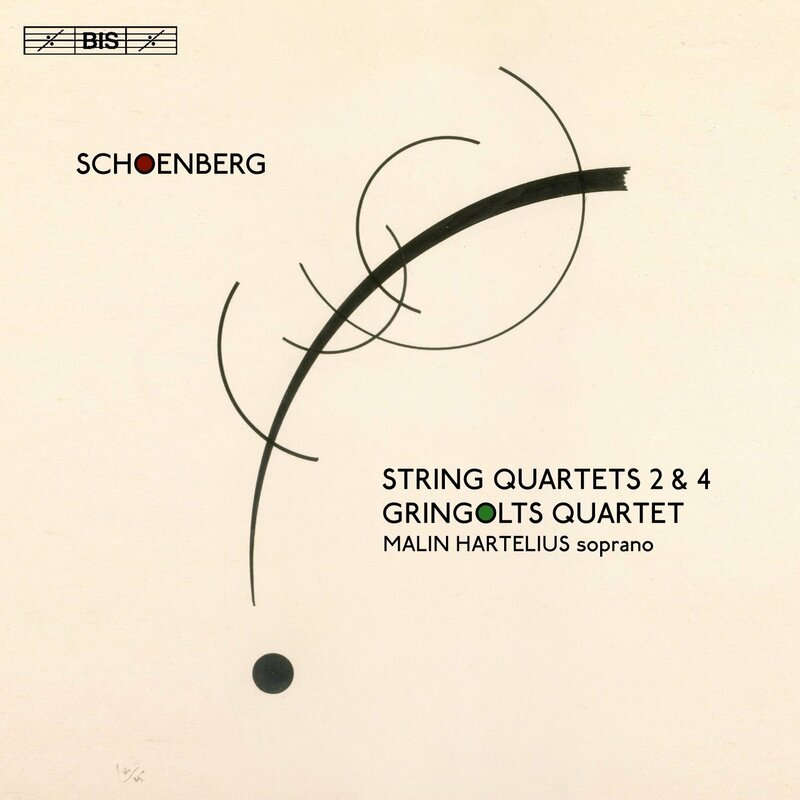 An excellent way to take Schoenberg's music seriously as music is with a recent recording of his String Quartets 2 & 4 (BIS 2267) by the Gringolts Quartet with soprano Malin Harlelius joining in for the 2nd Quartet. Both of these quartets are masterpieces of their kind. The Second Quartet was in effect a product of a personal breakthrough, brought on in part by Mahler's abandonment of Vienna for the United States, an affair between Schoenberg's wife and an artist who was living with them, and Schoenberg's own turn to painting. It was 1907-08. 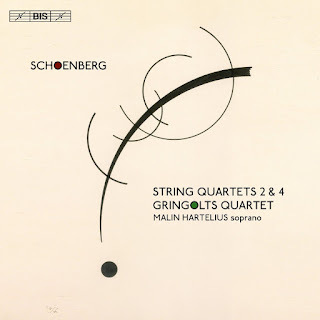 The Second Quartet marks a serious turn in Schoenberg's approach, essentially away from Late Romanticism towards an expressionism that incorporates the limits of tonality and a motival intertwining that no longer quite relates to harmonic movement. The fourth movement and its incorporation of a soprano part shot outwards to what at the time were the limits of expression. It no doubt shocked its hearers in those days, but most certainly not us, those of us who have become accustomed to outward movement in modernity. Then there is "String Quartet No. 4," which takes us ahead to 1936 and Schoenberg's exodus-exile from a toxic Nazi state. Understandably it was another trying time for the composer. This is fully mature Schoenberg, an extraordinarily complex and brilliant construction of color and motif, beautifully idiomatic string writing, and dynamic upheaval that transports one to a very rarified modern musical world. This happens to be an excellent performance of the two quartets. The Gringolts Quartet know very much what they are about and pay close attention not just to the notes themselves, but the syntactical sense behind them. Whether you already love Schoenberg's music or need to expose yourself to the best of it to learn to love it, this release is an essential! Virtually nobody who listens carefully to Gustav Mahler's Symphony No. 5 in C Sharp Minor (1901-02) (BIS 2226) these days would doubt its greatness, unless one simply does not care for his music as a whole. Yet why do many recordings of the symphony leave me with the nagging feeling that something is not right? One of the obvious things about the 5th is true to a greater or lesser degree of all the symphonies. They do not so much sound like Beethoven, Bruckner, or Tchaikovsky at root, of course. Even though the opening theme of the symphony at hand alludes to Beethoven's 5th. It does so in such an oblique fashion as to have a similar rhythmic element, little otherwise. So too Mahler's treatment of the strings throughout the symphony. What they do in part relates to the classical-romantic tradition of what strings can do. But Mahler conceives of them in a matrix where much of the time the winds and brass are equal partners. 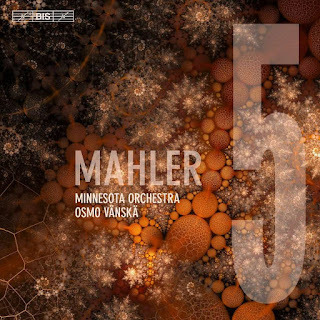 Osmo Vanska and the Minnesota Orchestra grasp all of this beautifully and give us a truly balanced reading of the 5th. It sounds like Mahler and nothing else, exactly. The three instrumental families blend together in perfect symmetry as the score requires, yet the tender melancholy of the Adagietto lets the strings shine in their heartfull outpouring of mixed feelings. This is a work that exemplifies the brilliance, yet also the beginning of the twilight of fin de siecle Vienna. Culturally all is still at a peak, yet the Austro-Hungarian Empire's containment of so many social-cultural subgroupings is troublesome and of course eventually the center could not hold. What "bothered" some contemporary hearers of the 5th is the inclusion-extrusion of "impure" folk ethnic elements interspersed throughout the work, Bohemian, Viennese, Slavic, Jewish strains of an earthy sort taking their place beside more classically derived thematic material. Of course this is part of what makes Mahler Mahler. The 5th has no grand choral finale ascending to high heaven, which only served I suppose to remind sceptical listeners that what remained made them uncomfortable. Today of course we revel in such carefully intersected contrasts, such synthetic brilliances. Osmo Vanska understands all of that and gives us a sonically full, sympathetic reading of the totality that goes into Mahler's 5th. The details are everything. Not all versions of the symphony I have heard do justice to the at first perplexing jumble or elements. It is no jumble, in the end. It is all Mahler heard and embraced around him, and it is his brilliantly personal concatenation that the Minnesota plays for us so engagingly and idiomatically. There is joy and sadness, a hazy nostalgia and a briskly contemporary Viennese encompassing of what need not be thought of as opposites, all elements taking their essential place in the artful scheme. The Minnesota Orchestra brings us the score in all its fulsomeness, with vivid sound staging and dramatically detailed balance. It is music that must be allowed to breathe. There may be divinity in its sublimity, but it is firmly of this world. Vanska feels the totality of it and brings it to us in spectacular Mahleresque ravishment. Here is a reading that puts together what Mahler intended, true to the tabula rasa deja vu complexities and beauty. Strongly recommended! Some music hits you from the first with a special moodiness. 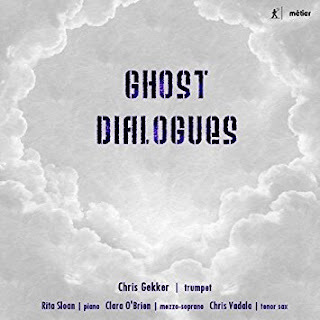 Enter Ghost Dialogues (Metier 28572), an album of modern chamber music featuring the very dynamic trumpet playing of Chris Gekker. He joins with pianist Rita Sloan, mezzo-soprano Claire O'Brien and tenor saxist Chris Vedala in a program of haunting, autumnal reflections perfect for steeling oneself for the longer nights to come, or simply for deeper reflections no matter what the time of year. The duo pairing rules with the exception of one trio. Some of the works have a solemn majesty, some a jazzy approach, all have a reflectiveness in some way, and all show Chris Gekker to be a marvelous, singing trumpet presence. Some have a modernistic edge harmonically, but all seem contemporary in the wide sense of the term. "Fall" (2016) by Robert Gibson sets the tone with an almost aching retrospection and beauty, the piano setting up lush tapestries of sustains that the trumpet completes in kind. 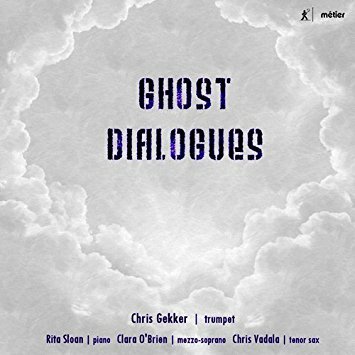 "Ghost Dialogues" (1993) for trumpet and tenor by Lance Holmes deepens the mood and has an open freedom that reveals vistas ahead. Carson Cooman brings us three movements of seasonal change with his "Equinox Sonata" (2015) for trumpet and piano. A timeless feeling and a lyrical facticity makes this one stand out. Another Lance Hulme work, "The Street has Changed" (2015), takes a reflective text and creates still more reflection for mezzo-soprano, trumpet and in the final movement offstage piano. There is space to punctuate, notes to remind us that space is not the primary element! Two shorter goodbyes top off the program memorably, "Served Two Ways" (2011) for trumpet and tenor by David Henrick is filled with jazz lyric strength, then buzzing energy. And Kevin McKee's "Song for a Friend" (2015) for trumpet and piano gets the last word with a kind of regal, beautifully tuneful musing. I guess you could call this one a sleeper in the best sense. It is filled with many small and less-small treasures. All performers are peak, but Chris Gekker is the very artful, brilliant constant. It may not be what you might ordinarily seek. That is why I am here, to tell you about the things you might overlook. Do not do that with Ghost Dialogues. The brown study side of you will gravitate happily to this program. Composer Erik Bergman (1911-2006) wrote some significant Choral Works 1936-2000 (BIS 2252). 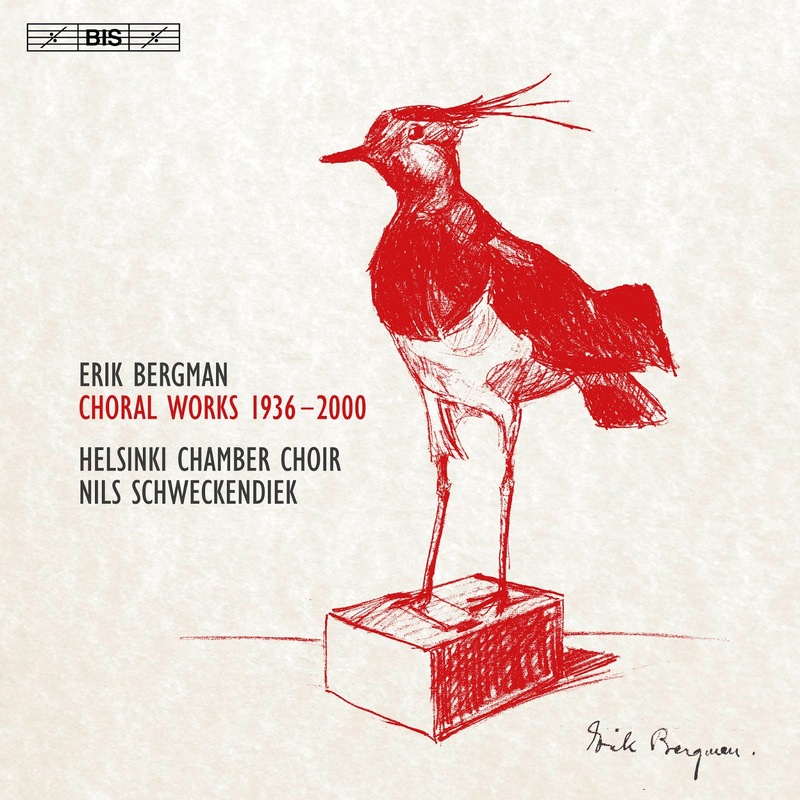 We hear a nice selection of them on today's two-CD set, as sung by the Helsinki Chamber Choir under Nils Schweckendiek. What first impresses is the sheer quantity of quality high modern moodiness. In all we get 19 works from the long time span. There is a continuity of style, generally speaking. Bergman lived a long life and was compositionally active for most of it. As the prominent Finnish modernist of his time, he was celebrated in his home country but less so in the world at large. He wrote extensively for choral groups. The selection of mostly mixed choral works on the disk have not been often heard, so we are fortunate to have this set to fill out the picture of Bergman's oeuvre. The music will certainly appeal to you if you are a modernist at heart. Bergman goes his own way. There is much to explore. Give it a listen! 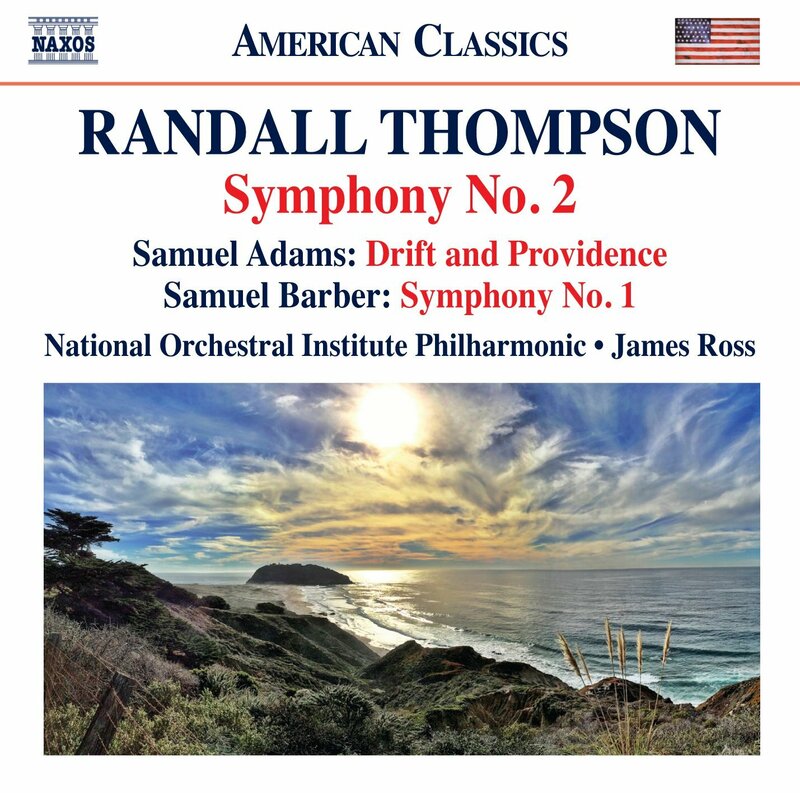 Classical-modern American Symphonies both older and new are the fare on the release by James Ross and the National Orchestral Institute Philharmonic. In the slot of primary billing is Randall Thompson Symphony No. 2 (1931) (Naxos 8.559822). Included in the volume are also Samuel Barber's "Symphony No. 1, Op. 9" (1936) and Samuel Adams' "Drift and Providence" (2012) . It is a bit of Americana without going out of its way to be so, quasi-Nationalism without any overt gestures thematically. Thompson's Second has syncopation that is not quite jazz (of 1931) but has something of the lively rhythmic bustle of the age and place. Samuel Barber's First has American pathos and breadth. 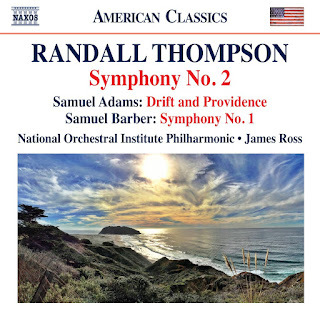 Samuel Adams and his "Drift and Providence" updates the quilted earthiness of American symphonic form for today yet does not insist on overt modernity. We get a generous sampling of the symphonic form beyond the overtly romantic. All is well played by the National Orchestral Institute under Ross. It is not music that will change your life, exactly. Nonetheless there is much pleasure to be gained in the hearing. Recommended.